The Democratic People's Republic of Korea is considered to be the most oppressed country in the entire world. Nonetheless, football exists in North Korea as much as it does in any other nation, although in this part of the world things are a bit different to say the least. The "Highest Class Football League" as the nation's top tier league is called, has been around since 1972, although it was originally known as the "Technical Innovation Contests", for reasons you and I will likely never know or understand for that matter. Since its inception, Pyongyang based April 25 Sports Club (or simply 4.25) has been the most successful club, winning the North Korean championship 14 times. But the atmosphere and general sights one may see in the country's stadiums are pretty different from those in other parts of the world. From the staged support which is divided so carefully right down the half of the stadium, to the occasional visits from its glorious leader Kim Jong-Un who sits at a fancy table while watching the match, the sights are indeed quite peculiar. Today, I decided to post a few rare football video clips shot in this politically secluded nation. This video from 2013 shows a league championship match, which also happens to be a Pyongyang derby between Pyongyang City and April 25. A glorious display of pre-arranged support, interviews showcasing overly excited fans (who probably know as much about football as I do about local directions in Pyongyang) and even some football action. A couple years back North Korea launched a football academy which (with my limited Korean) I think was built to support its international football system. This video is so cheesy it needs no translation. 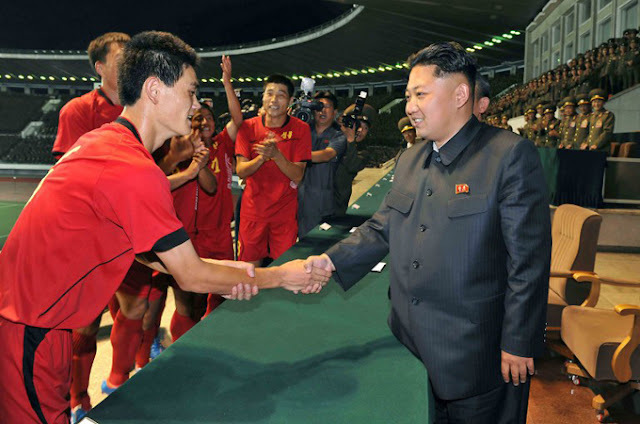 Last but not least, we take a look how the friendly dictator takes in a match in Pyongyang, and best of all (at the end) how the players celebrate their "beloved" leader more than the victory itself.